We finally saw the much awaited Apple’s media event on Wednesday here in Sans Francisco. The Cupertino-based technology giant eventually raised the curtains on its latest star products. The CEO of Apple, Tim Cook and Chief Phil Schiller announced the products on stage at Yerba Buena Center for the Arts. Apple has made some remarkable announcements as was expected in the event. The announcement of new iPad and Apple TV made all those rumors true that we heard from different sources since the company announced the event. Apple’s new 9.7-inch iPad features 2048 × 1536-pixel retina display, 5-megapixel camera having same optics sensor used in iPhone 4S and 1080p video capturing. It will go on sale from March 16 and will be available in black and white variants. Furthermore, the tablet sports A5X chip with quad-core graphics and also has show support for 4G LTE networks. The device is 9.4 millimeters thick and weighs around 1.4 lbs. As for price, the Wi-Fi only iPads will be offered at $499 for 16GB, $599 for 32GB and $699 for 64GB models. However, 4G models will cost $629 for 16GB, $729 for 32GB and $829 for 64GB. Apple says that you can pre-order your device from today (Wednesday). The device will hit the stores in 10 countries on March 16, including U.S., UK, Japan, Canada, Switzerland, Germany, France, Hong Kong, Singapore and Australia. 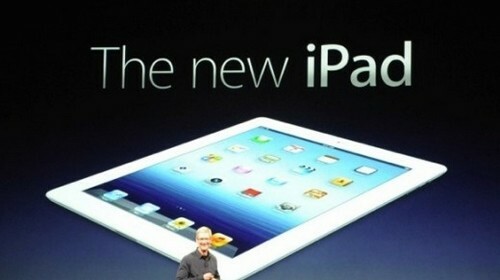 You can check the complete specifications for the new iPad here. The Cupertino-based company also said that it is currently working on two LTE version of the iPad with Verizon and AT&T in the United States, while with Rogers, Telus and Bell in Canada. US models will be 3G ready as well. The event opened with Cook announcing the post-PC sales figures. He said that the company sold 172 million iPads, iPhones and iPods in fourth quarter of 2011, which accounted for 76% of revenues for that quarter. He also announced that the iOS 5.1 is available from today and Siri is available in Japanese. As for iPad sales, Apple sold 15.4 million devices in last quarter, while HP shipped 15.1 million PCs for the same quarter.